Daydreaming about having a destination wedding on an exotic beach surrounded by all of your friends and family. It's time to turn those dreams into a reality at the luxury resort akyra Beach Club in Phang Nga, Phuket. There's no place more romantic to share your vows with your lover than on a sunset beach in Phang Nga. With sandy white beaches and ruby red sunsets, it's the perfect place for love birds to gather and celebrate. Plus, when the wedding is over you are already in your favorite honeymoon spot! 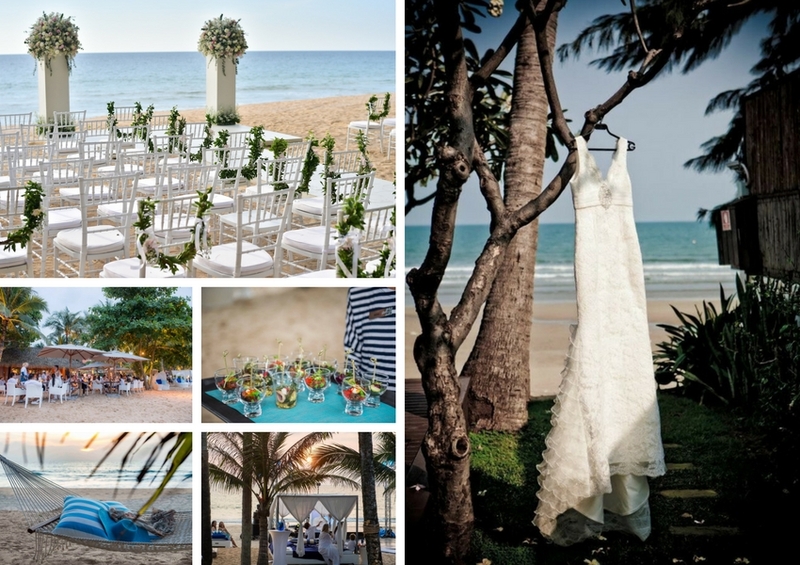 Planning a wedding half way around the world may seem like a daunting task at first, but with a little foresight and the helpful staff at akyra Beach Club Phuket you can have the wedding of your dreams. Here are some great tips on how to start planning your destination wedding today! Don't let the rain ruin your special day. Plan your visit around the rainy season (May to October) and enjoy your wedding during Thailand's cool season between November and February. Phang Nga's best weather comes during these months. You can expect dry and sunny days with a calm ocean. This is also the best time of year to be out on the water. You will be able to rally up your wedding guests for some fun beach activities like jet skiing, parasailing, and fishing. If you go during mid-December, there is a special event in Phuket called the King Cup's Regatta where you will get to see the entire city lit up with lights and celebration in the streets. It's definitely one of the busiest times of year on the island and would be good if you want to really see the vibrant culture of Thailand in action during your stay. However, if you are looking for a month with less people, January will be less flooded with tourists. Whereas, November and December are the cooler months of this time of year, January and February tend to be warmer. February would be another good time to plan a wedding if you are hoping to see the city in a festive mode. The Chinese New Year is celebrated during this month. Expect to see lots of fireworks and big dragons dancing in the streets. The celebration occurs all over the island. It is strongly recommended for couples to get a sense of their wedding space in advance. Planning a pre-wedding trip months before or just getting their a couple weeks before the wedding is always a good idea. This will give you an opportunity to work out any small details and really start to imagine your special day at akyra Beach Club. There's only so much you can really learn from looking at pictures online. Friendly staff at akyra Beach Club will be happy to walk you through the luxury resort and give you information on how most wedding events are planned on the beach. There may be certain parts of the beach that work better for your desired wedding ceremony. Plus, you can scout out the resorts accommodation that would be best for certain members of your family. If you know your mother-in-law is going to want a room in the gardens, we can make that happen. Another good reason to have a pre-wedding trip is just to enjoy the wonderful amenities at akyra ahead of time. Once you become familiar with our resort and all it has to offer, you can get your wedding guests excited for not only a lovely wedding but a relaxing vacation on one of the most beautiful places in the world. 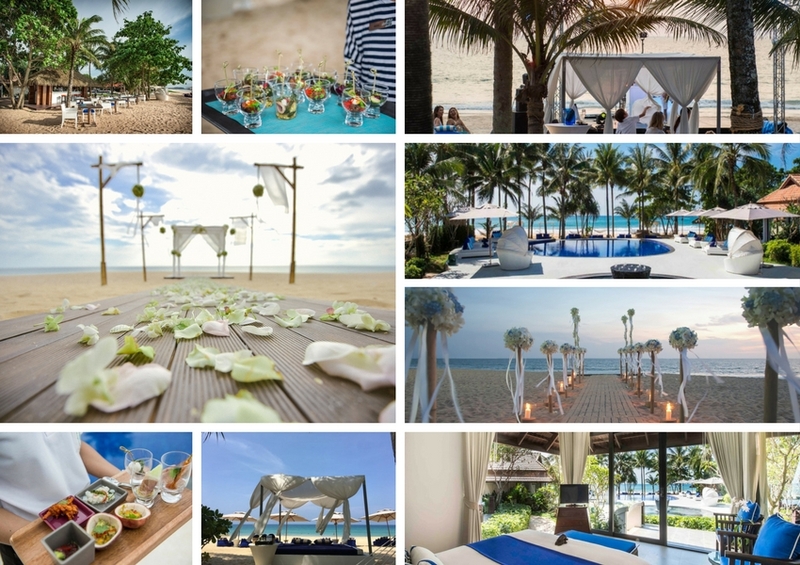 At akyra Beach Club Phuket, we proudly offer a Blissful Wedding Package for our guests. For a Western style wedding, the package covers you and your fiance plus up to 30 guests. The package includes your own personal wedding planner to help you oversee all aspects of your big day. Included in the package is also the altar decoration, a beautiful 2-tier wedding cake, romantic additions to each guest's room, and a special wedding certificate from the resort. If you are looking for something less traditional, we also offer Thai wedding packages that include a Buddhist monk ceremony. With everything from floral arrangements to spa packages that help you feel beautiful for your special day, we can customize your wedding package so that it meets your every need. The flower packages include fresh and locally sourced flowers--orchids and lotus--to make up your wedding bouquets and corsages for the event. Spa packages can include deluxe luxury massages for you and your loved ones and make up artists for your favorite bridesmaids. A food and beverage planner will also help you pick out the perfect table setting to match your wedding theme. You can choose a buffet style or table service dining for your guests. A BBQ grill with our best grill master on deck can also add a unique flavor to your wedding day. Our bartenders will keep the champagne flowing as you and your guests enjoy socializing and getting down on the dance floor. A good wedding can be a great wedding with the right kind of entertainment. 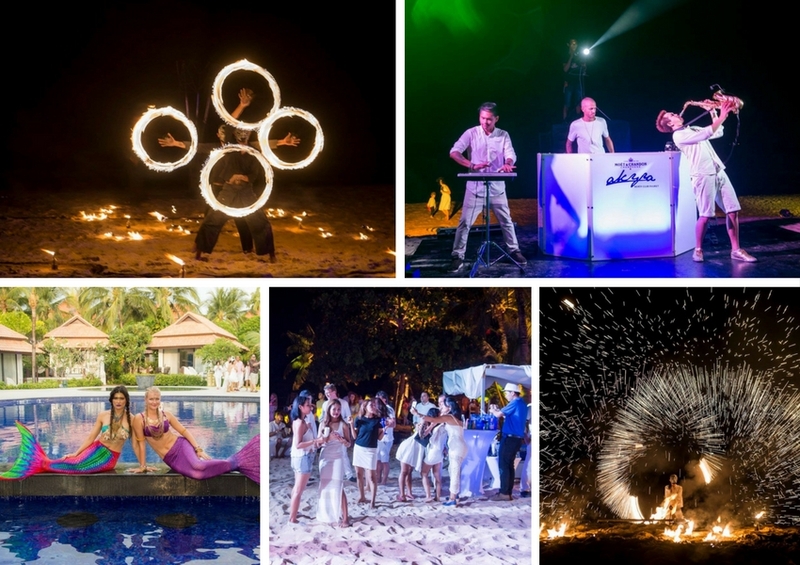 At akyra Beach Club, we have many options for musical entertainment to match your wedding. Whether you are looking for something lively or more relaxing, we've got the perfect musicians to match. For something more classical and laid back, our classic duo will provide some beautiful notes on guitar, violin, saxophone, and piano. However, if you need something with a little more pep, we also have live DJs to keep those dancing tunes spinning all night long. Don't sweat the sound either. We have a modern 2-speaker sound system that you can even hook your phone up to if you want to be your own DJ. Once everything is set in place, you can feel free to kick back, relax, and have some fun! Start planning your beach wedding today so that you and your loved one can look forward to the best and most memorable day of your lives together. Don't hesitate and give us a call today!